Susie I adore this and the flouncy look…I love phlox but some of mine is slim in blooms and the voles destroyed a lot in the front garden…and the silvery foliage was a perfect compliment! Really wonderful! Thanks Donna. Flouncy is a good description. Bummer about your voles. I too have the little pests but they don’t seem to bother my phlox, most everything else though. 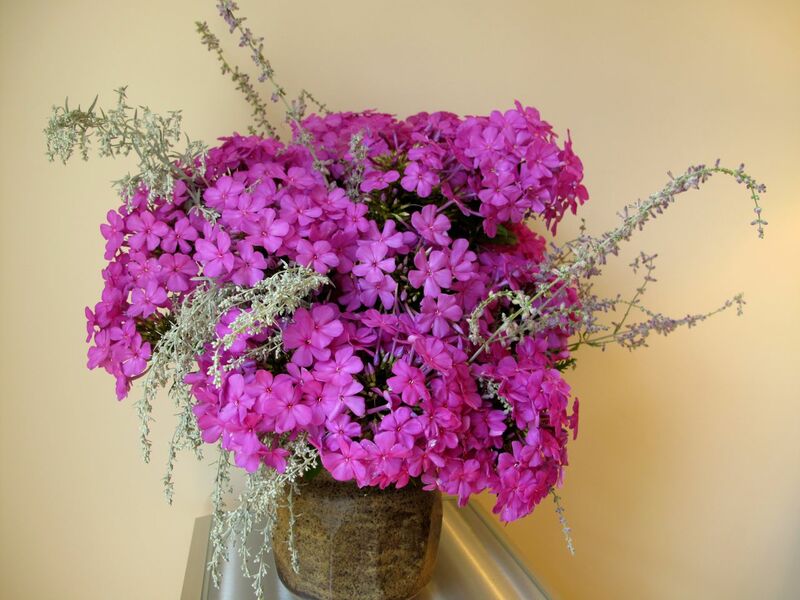 The phlox would brighten anyone’s Monday and get the week off to a happy start! The Dusty Miller and Russian Sage add just the right soft touch. Thanks, I’m happy the phlox decided to bloom again. Beautiful arrangement. I have a soft spot for phlox because my grandma always had it in her garden and so I have it as well. But, I get powdery mildew each year. Do you get it on your plants? Thank you Judy. One section that is in more shade had powdery mildew. Don’t know what to do about it. Could not be more beautiful! Thanks Judy. I’ll enjoy having these cheery phlox in the house this week. Ah, Phlox! Another plant I’d love to grow, Susie. It immediately succumbs to mildew here so it’s not an option for me, even if I could meet its water needs. Yours looks great with the touch of silver accents. Thanks Kris. 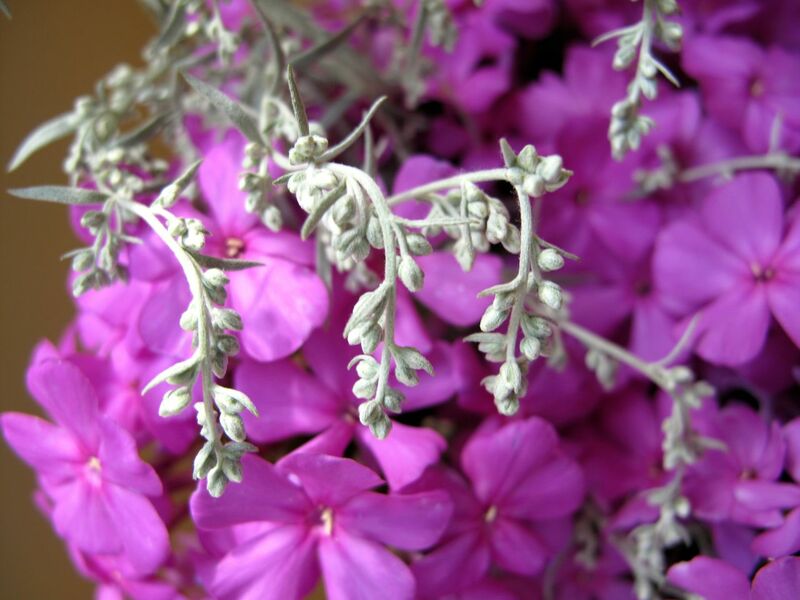 Mildew is a problem with phlox. These had dried up from lack of rain, but in the past couple of weeks we started getting lots of rain. I was happily surprised they made a come-back. A bouncy effect, I like that and it fits the arrangement well. Beautifully photographed as well! Thanks so much! The phlox seemed exuberant while I was working with them. Thanks. This magenta pink color would look at home in your cutting garden Christina. I really like using phlox in the border but as I mentioned above, this is the only one I’ve been able to get established. Definitely flouncy – I like this pink, as you would have guessed, and the ‘dusty miller’ proved to be an ideal foliage accompaniment, softening the pink without too much contrast, and the perovskia does the same. I have enjoyed experimenting with cutting down longer stems, like you have done here. The pins on the ‘frogs’ I bought often gather rust when I use them, although much of it washes off – is this to be expected, or are they duff frogs? This is definitely an arrangement for fans of pink-colored flowers. I enjoyed working with the high-spirited phlox! Not sure about the rust issue Cathy–look for frogs with brass pins, maybe that would work better. It’ s beautiful Susie. The Phlox is set off beautifully by the Artemesia.and Perovskia. I love it. I wish I could grow Phlox . Thank you Chloris. Phlox grew beautifully in my former garden, but it has been more challenging in this one (just 7 miles away). This particular Artemisia (Dusty Miller) was a pass-along plant from a special person. It runs around in a friendly way, unlike other clump-forming artemisia I’ve purchased (the garden center always carries ‘Powis Castle’). I’m still waiting for my phlox to flower, your is a lovely colour and makes a super arrangement! Thanks Pauline. 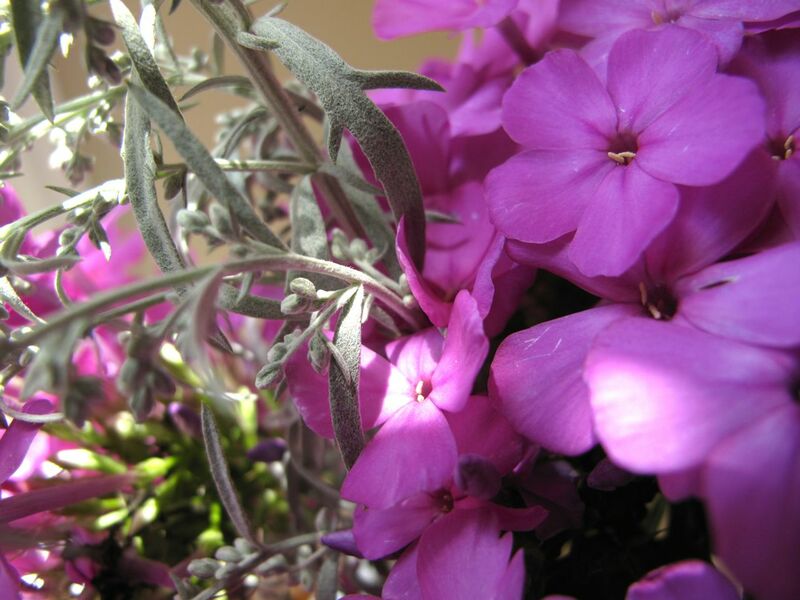 Hope your phlox greets you soon! I really love this. I love the magenta pink and the feeling of overflowing abundance in the arrangement. Gorgeous! Thanks Ann, you captured the mood of this perfectly: overflowing abundance. There was a generous amount of phlox this week to use, unlike many weeks when I have only a few stems with which to work. I like your idea to go for a bouncy hairdo effect; it worked! Thank goodness for the rain! We need it now to put flower buds on the spring-blooming plants! Marian, when I worked on this I kept thinking of that bouffant hairdo and it seemed like a happy arrangement. The rain has been a relief. Let’s hope we continue to get a few showers here and there. I like Donna’s word ‘flouncy’! It is a lovely soft effect and the silvery foliage of the Perovskia with a hint of blue brings out a slight violet tinge to the phlox blooms. Really beautiful arrangement Susie! Thanks Cathy, it is a flouncy, bouncy arrangement alright. It almost felt a bit overdone, but there are times when enthusiasm just overflows. I was happy to have so many phlox to work with yesterday so just kept adding them in. 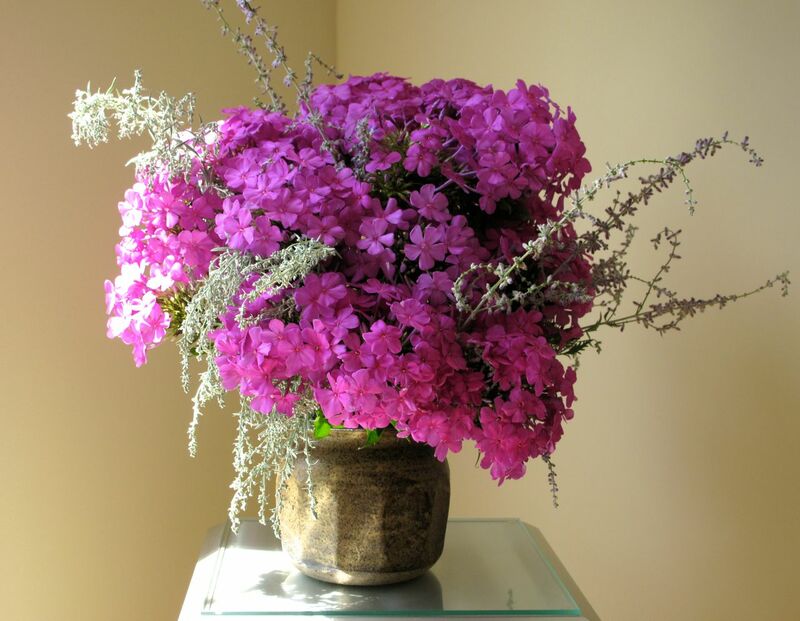 What a great use of pink phlox Susie! It is also my most successful colour in the garden, although I prefer the other more delicate shades. In your vase it looks stunning and I love the addition of the silvery shades. Thanks Julie. So your pink phlox is more vigorous as well? Makes those other colors all the more desirable when they’re more elusive. Lovely! I have cut Garden Phlox for the house because we have plenty in the garden and I like the scent but have never though of cutting them short and arrange them as you’ve done. Your arrangement looks far better than just tall stems in the vase as I did. Thank you for a great idea. 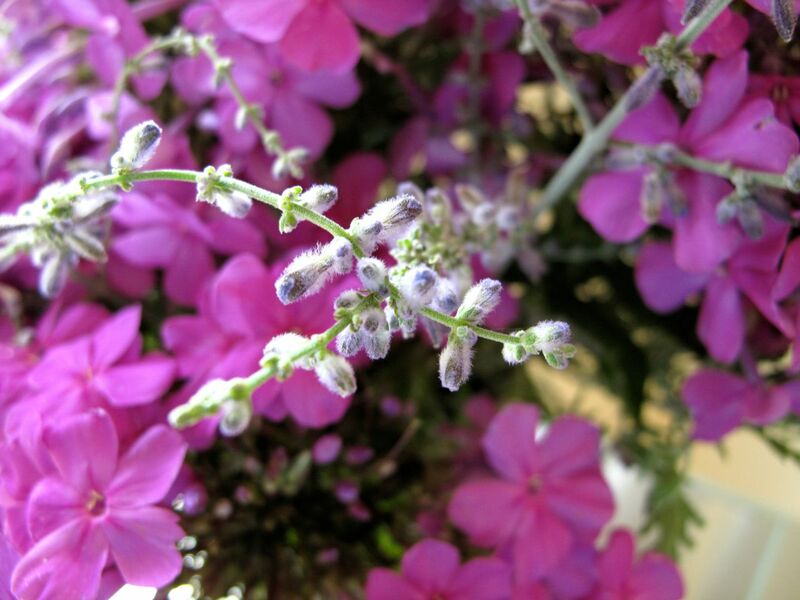 Have fun arranging your phlox. This is the first time I’ve ever cut more than 2 or 3 at a time. For this I probably used 18 or so. Phlox are pretty in a vase, but I find them a bit messy. Little flowers are falling throughout the day. 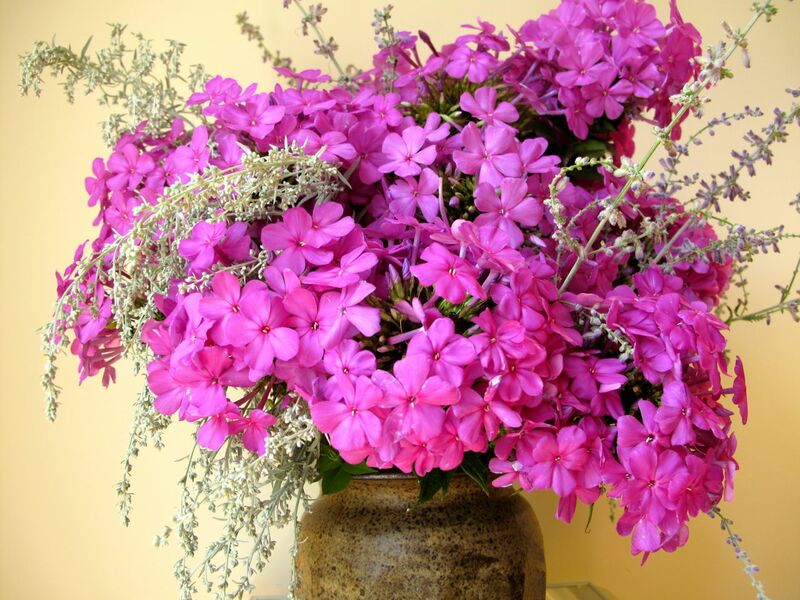 I like the phlox, also the earthy vase. Thanks, that vase is one of my favorites. Thanks Elizabeth. Glad you can enjoy planting in a big garden playground now. oh so lovely:-) I enjoy stopping by and seeing others and how they put everything in a vase. I always mean to put some in a vase for inside, but I never seem to get the flowers there…yours are beautiful:-) I need to get over my picking phobia! Thank you. I’ve always loved cutting flowers for the house and rarely hesitate. Try just a single stem in a vase or three tiny flowers in a small glass for instant satisfaction. I love the combination of silver and bright hot pink. Glad you like it. Pretty bold color on that phlox so it needed something to balance it out.